Any trip to Glacier Bay is a magical experience, but on a small yacht charter with the world-renowned photographer Art Wolfe is an opportunity that will change your life! Cruising the majestic bay in this small yacht is quite a different experience than traveling in one of the large crowded cruise ships. Glacier Bay, perhaps the most spectacular fjord complex in the world, contains 13 active, calving, tidewater glaciers. These rivers of ice are born in the Fairweather and Takhinsha mountains which surround the Bay rising 15,000 feet above sea level. Cruising in Glacier Bay with Art Wolfe you will be able to see all of this and brown and black bears, deer, wolves, moose, humpback whales, orcas, dolphins, sea lions, seals, sea otters, mountain goats, bald eagles, puffin and a wide variety of migrating water fowl. You are encouraged to arrive one day prior to the workshop so that the entire group can convene the morning of June 20th to prepare for departure. We have secured group rate rooms at a local hotel in Juneau. Upon registration you will download a PDF that includes the hotel information. Please call the hotel directly and reference the Art Wolfe workshop. Meet and greet at 6pm no host dinner at restaurant in Juneau. Everyone can introduce themselves, and Art will give a brief description of the upcoming tour. A full day in the Beardsley Islands of Glacier Bay – you’ll be able to kayak as little or as much as you want and to make images from either your kayak or from the comfort of the beautiful yacht deck. Arrive in port of Juneau at approximately 12pm. Cruise ends in the morning following breakfast. We have a night reserved at the hotel in Juneau for those that do not want to depart on this day. 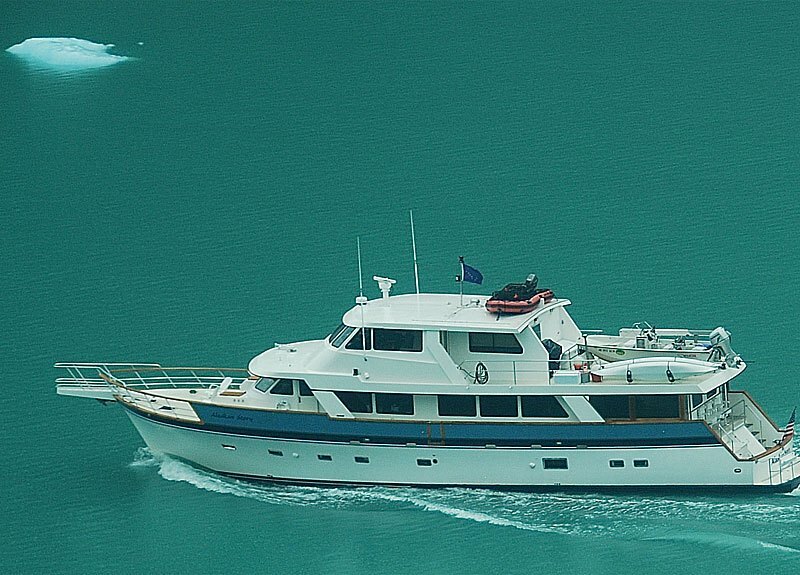 The Yacht has been redesigned and completely rebuilt to give our guests the best Alaskan charter cruise. New teak interior, all new stainless-steel appliances, new aft dining area with 270 degree view and enclosed top deck pilothouse where the guests can sit comfortably with the Captain and view the natural beauty and wildlife of Southeast Alaska. The galley, saloon, dining area and day head are all on the main level. Two aft staterooms have walk-around queen beds and the two forward staterooms have two twins each. Of course all the staterooms have bathrooms including showers ensuite. Each stateroom has its own thermostat to control heat. There is a spacious TV/Reading room forward and additional cabins and bathrooms for crew. The Alaskan Story has a seventeen foot Boston Whaler with 90 horsepower four stroke Honda outboard. As a backup we have a 12 foot inflatable with 18 hp four stroke outboard. We have three double kayaks. We provide all salt-water fishing gear for both salmon and halibut and have crab and shrimp pots which the crew will assist the guest in tending. Again, all of this to give our guests the best Alaskan cruise. Mechanical: The Alaskan Story is powered by twin 570 horsepower turbocharged Caterpillar engines. She has two AC generators of 27.5 and 20 kilo-watts. She has large inverters and battery banks which allow the generators to be turned off at night for the quiet enjoyment of the anchorage and wildlife. She has a water-maker capable of making up to 1200 gallons of water a day. These amenities assure you of having a true small ship Alaska cruise. Electronics: Consistent with the redundancy philosophy of the owners the Story has two iMac based systems for navigation using electronic charts from several manufacturers. The vessel is equipped with GPS, AIS and 24 and 48 mile radars. Fire extinquishers are throughout the vessel and the engine room has an automated system. Shared accommodations unless single supplement requested.